GTR’s Asia Trade & Treasury Week returned to Singapore from 4 to 7 September 2018, reflecting on a momentous year for global trade and its influence on the Asian market. Bringing together a record-breaking 1,100 industry participants, from local and international banks to multinational corporations and SMEs, independent financiers, commodity brokers and traders, insurers and risk managers, lawyers, consultants, ECAs and multilaterals, the event covered a wide range of topics, from the impacts on Asia of the US-China trade war to the outlook for intra-regional trade, and the perennial hot topic of digitisation and the use of tech in trade. 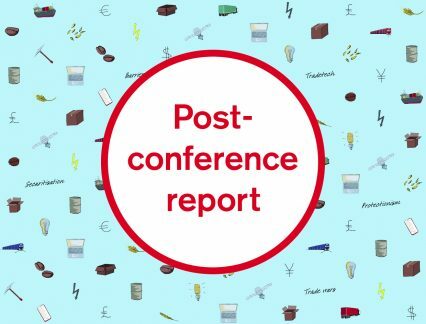 In this post-conference wrap-up, Eleanor Wragg brings together some of the main takeaways and key insights. The economies of Asia Pacific saw a return to robust export growth in 2017, reflecting the global recovery in output and investment. The region now contributes more than a third of the world’s exports, according to the Asian Development Bank’s (ADB) recently-released Key Indicators 2018 report. By 2030, Asia will account for the lion’s share of global GDP, at around 40%, with China making up approximately half of that. But with the global trade environment fragile and the US-China tariff conflict escalating, it is questionable whether the momentum can continue, especially if global supply chains, in which Asia plays a key role, take a significant hit. “Governments in the region are asking: ‘Now what?’” said Deborah Elms, executive director of Asian Trade Centre. “Wars start when trade stops.” This comment, made by Chinese e-commerce giant Alibaba’s group chairman Jack Ma in 2016 and quoted by a number of participants at GTR’s Asia Trade & Treasury Week, is arguably more relevant today than ever. However, Asia’s growing trade and investment linkages are helping to buttress it against uncertainties in the global trade policy environment, with PwC research showing intra-Asean export volumes increasing at roughly 1.5% each year to a predicted US$375bn by 2025. Elms underlined that, although global agreements are preferable to regional deals which exclude certain countries, regional trade agreements offer some buffer from chaos when a global accord on trade is unfeasible. Meanwhile, questioning the future of globalisation amid rising protectionism, Tony Nash, CEO and founder of Complete Intelligence said that the regionalisation of supply chains is “better for everyone”. But Asia is not out of the woods yet. “China’s rise is not likely to be benign,” said Manu Bhaskaran, director of policy advisory at Washington DC-based Centennial Group International. For him, the unwillingness of incumbent powers, the US, Europe and Japan, to cede power on trade, coupled with the rise of other trading powers such as India, South Korea, Indonesia, Turkey and Brazil, mean a higher risk of geopolitical shocks, threatening once again to disrupt the flow of trade. Currency realignments are underway as Asian currencies rise against the dollar and euro. Meanwhile, the renminbi is forecast to rise against other Asian countries. The Asean Economic Community will gradually expand, and subsets of countries will integrate faster, from sub-regional trade hubs such as the Greater Mekong area to macro cross-border clusters such as the Iskandar region, which spans the Malaysia-Singapore border. A big increase in physical connectivity as high-speed railways, roads, electricity grids and pipelines are rolled out will be driven by the region’s wave of urbanisation, ushering in a golden age of Asian infrastructure under reformist governments. Positions on the value chain are changing across the region, with China moving upwards, and low-end manufacturing shifting to other Southeast Asian countries. Meanwhile, India is poised to become a low-cost alternative to China in some areas of manufacturing with Prime Minister Modi’s “Make in India” campaign and the goods and services tax (GST) reform seen as driving change. Major technological advancements present both upsides and downsides, with the advent of additive manufacturing and 3D printing seen as putting the labour-intensive industries Vietnam depends on at risk. Meanwhile, as a result of advances in solar and wind power, Asia now accounts for nearly two-thirds of the worldwide increase in renewable energy generating capacity, attracting massive investments. Other areas for growth include biomedical, agtech and e-commerce. Competition is growing as other emerging nations become more competitive. Improving fundamentals in Mexico, continued economic success in Peru and a conducive climate in Poland place them as serious contenders in key markets, although the growing trend towards reshoring of manufacturing by developed countries is yet to make a sizeable dent. Supply side improvements are evident, with Thailand, Vietnam, Indonesia and India all jumping several places in the World Bank Doing Business report in the period 2017 to 2018. Malaysia’s economic transformation programme and the improvement of former laggard countries such as the Philippines have led to a surge in Southeast Asia’s share of world FDI. Behind the largely positive numbers for Asian trade, clear winners and losers are emerging in what remains a very diverse region. According to research by Rebecca Harding, an independent economist and CEO of Coriolis Technologies, Asean has led trade growth throughout a global downturn, with an increase of 3.4% versus a global decline of 0.7% from 2012 to 2017. A deep dive into the numbers suggests that supply chains are shifting, indicating greater self-sufficiency, said Harding. Over the same period, Asean’s export values to China declined by 3.7% each year, and export values to South Korea and Hong Kong are forecast to increase by an annualised 6.7% from 2018 to 2022. Far from being the world’s low-tech factory, Asean exports of aerospace and satellites are seen growing by 6.3% year-on-year from 2018 to 2022. Exports of services are also on the up, with the region hosting eight out of 10 of the countries with the largest share of information and communications technology (ICT) in their exports. “The Asean landscape is encouraging,” said Munish Kaushal, area finance director, Southeast Asia for GlaxoSmithKline Consumer Healthcare, adding that he continues to look at investment in the region. Nonetheless, policy and regulatory swings present barriers to doing business, with Malaysia’s decision to revert to the sales and services tax (SST) from the goods and services tax (GST) and Vietnam’s new medical device regulations creating uncertainty. Meanwhile, political risks remain high in several countries. “While we have less concern now around political risk in Indonesia, projects are being delayed in Vietnam due to a crackdown on corruption,” said Robert Cooper, regional director, credit, political and security risks, Asia at JLT Specialty. The competitiveness of Asian goods and services globally is also coming under increased scrutiny, as rising wages and currency movements chip away at labour arbitrage. “A depreciating currency is not a competitive advantage. Competitiveness is about what a company and country does,” said Gopul Shah, director, corporate treasury and head of structured trade finance at Golden Agri-Resources. One country where this has become evident is Sri Lanka, which is now being forced to weigh wage increases to tackle labour shortages in its apparel sector. “Sri Lanka is more exposed to international capital markets than before. We no longer have labour arbitrage, and so we need other features,” said Anushka Wijesinha, trade advisor at the Sri Lankan ministry of development strategies and international trade. For him, Sri Lanka’s competitive edge now lies more with its trade agreements than with its workers. “We have preferential market access to India and Pakistan and a free trade agreement with Singapore,” he said, adding that along with preferential access to the EU, these are “compelling” and signal good quality. Wijesinha said that since the signing of the agreements with Singapore, the Sri Lankan government has received US$16bn in FDI proposals, and that the recent opening of both a Nike research and development centre and a London Stock Exchange technology facility further demonstrate the country’s movement up the value chain. But in a region which accounts for 40% of the global trade finance gap, where will the liquidity come from to continue supporting Asia’s burgeoning trade? Srivanasan Venkita Padmanabhan, global head of corporate finance at Olam International, said that banks in the region are “flooded with cash”, but that many funding providers were facing problems in getting visibility of borrowers’ creditworthiness when lending. “There is liquidity,” said Shah, adding that to overcome barriers, issuers are increasingly moving to bilateral markets and structured financing as ways of bridging the gap. With Singapore now firmly regarded as Asia’s premier hub for developments in trade-based fintech, the potential for technology to address the inadequacy of trade finance solutions in the market was an important topic of discussion for participants, who decried the fact that customers can move ships and goods across the world faster than they can move trade documents. According to the ICC Global Survey 2018, just 12% of bank respondents have successfully implemented technology solutions in their trade finance operations, which Atul Jain, Asia head of trade finance and trade flow at Deutsche Bank called an “embarrassment” for the industry. “Are banks digitising well? The survey results suggest not. Banks need to change, and want to change, but most don’t know where to begin. In order to progress, we need to make stronger efforts to learn from the market,” he said. Deutsche Bank’s acquisition of a 12.5% share interest in the receivables auction platform TrustBills last year and its purchase of Mumbai-based software firm Quantiguous Solutions this year are part of a softening of the view of banks towards fintech, seeing it not as a threat but as complementary to their activities. “When it comes to partnership models, banks owe it to their clients to try everything. We have to move past fear and realise that the only way to survive is together,” said Jain. Calling for banks to become “tech companies that happen to have a banking license”, Buckley pointed out that every sector within financial services has faced challenges brought about by technological advances, from the stock market to retail banking, and that now it is the turn of trade finance. “Non-bank actors entering the market are the canary in the coalmine,” he said. Interest in initial coin offerings (ICOs), the process of issuing cryptocurrency assets as a means of raising capital, is also growing in trade finance, as companies look for alternative ways to fund supply chains and raise capital. Simpler and faster than traditional cross-border fundraising, removing much of the complexity around different currencies, settlements and payment consolidations, ICOs help provide SMEs and start-ups in particular with greater access to a more diverse pool of potential investors, with blockchain-based screening solutions enabling quick funding and de-risking of transactions. “Regulation has created a trade finance gap,” said Raj Uttamchandani, executive director of Trade Finance Market, a digital marketplace for SME trade finance in emerging markets. “The trade finance space is hosting a war of innovators versus dinosaurs.” Huny Garg, global head of trade and supply chain at Swift, said that regulators are now playing a key role in driving fintech innovation, particularly in Singapore and Hong Kong. Where do funds fit into the established corporate/bank ecosystem? In a well-attended session which considered the impact of developments around trade finance asset distribution on the market, I-Mei Chan, regional head, distribution and credit solutions at Deutsche Bank, highlighted that a changing regulatory environment has made trade finance more expensive. “More and more banks are looking into securitisation and alternative investors,” she said, adding that one way for banks to tackle what are increasingly compressed margins is by creating different tranches of trade finance. With many corporates struggling to finance the long tail of their supply chains, several have begun to turn to alternative platforms for their invoice financing needs. “We have seen tremendous interest in trade finance, and lots of new entrants into the space,” said Christoph Gugelmann, co-founder and CEO of trade finance distribution platform Tradeteq. Trade finance has emerged as an asset class with appeal for institutional buyers, with a recent report by Greenwich Associates estimating it offers the possibility of between 3.5% and 5% net returns. However, the model for a fund to work within the trade ecosystem is not yet clear. Although many funds are keen to capitalise on the regulatory burden increasingly faced by banks, Holger Frank, head of FIG and GTB, Asia Pacific at UniCredit, cautioned that alternative investors should not place business assumptions on regulatory or operating risk arbitrage. Nonetheless, as new sources of finance enter the market, she called for banks to explore ways of servicing long tail clients and expanding to smaller suppliers, either in partnership with new players or through new approaches. Is China opening up or closing off? Forty years ago, the third plenary session of the 11th Central Committee of the Communist Party of China kicked off its “Reform and opening up” policy, leading to four decades of consistent annual GDP growth of over 9%. Comments by President Xi Jinping at the Boao Forum for Asia earlier this year seemed to be aimed at keeping up the momentum, with vows to further open the nation’s economy as the Middle Kingdom positions itself as the new defender of globalisation. But behind the rhetoric, outward investments by Chinese investors have been restricted, and foreign corporates remain limited to a narrow range of industries, although this is slowly changing. “There is a different approach in each industry, but we are seeing an opening-up in automotive and manufacturing as China is changing foreign ownership limits from 50% to 75% shareholding,” said Gergely Abraham, regional treasury and structured finance, Asia at Nokia. This dichotomy of opening up versus closing off remains a hot topic among corporates and financiers alike, who are navigating a confusing environment in their attempts to gain a foothold in the world’s second-largest economy. “The scale of China is very different,” said Lionel Taylor, managing director of Trade Advisory Network, who added that international buyers are coming to his firm to ask for help in entering the market. “There is no flexibility,” he said, pointing to SME finance in particular as a challenge. In the ICC’s latest Global Survey of 251 banks from 91 countries, 93% of respondents said that they saw regulation and compliance as the biggest obstacles to future trade finance growth. The myriad regulatory and compliance challenges currently facing the financial services industry in Asia bring with them a need for new ideas. Bankers and fintech providers came together to discuss the issues and come up with some solutions. While banks around the world are struggling to keep up with the ever-growing regulatory burden – “every seven minutes, there is a new piece of compliance”, quipped Graham Bright, head of compliance and operations at Euro Exim – those operating in Asia face an even greater challenge. “The only growth area in banks is compliance,” said John Turnbull, director of Certis International. Attendees agreed that constant dialogue with regulators in order to bring about some standardisation is vital to reduce the regulatory burden across Asia. “We see regulators at different stages of understanding trade finance in the region, but regulators see trade finance as a key risk to be understood,” said Anupam Verma, chief executive of ICICI Bank, Singapore. Moreover, understanding the difference in priorities between regulators and financial institution was seen as key to making progress. “Regulators are most interested in customer experience. In our discussions around trade finance, we have found that the regulators are asking for education from banks,” said Euro Exim’s Bright. According to PwC, headcount costs represent around 80% of the anti-money-laundering (AML) budget for banks as many of these tasks are still being done manually. In many cases these costs are passed on either directly or indirectly to the client. “When banks spend time and resources on compliance, that squeezes credit availability. As a result, the trade finance gap will get higher,” said MUFG’s Garg. For companies, too, the squeeze is being felt. “It used to be credit first, but now the compliance committee sits on top,” said Victor Goh, treasury manager at Singapore-headquartered manufacturer Giti Tire. In order to combat financial crime and manage sanctions risks, attendees highlighted the need for financial institutions to have the right resources and technologies in place to detect activity such as trade-based money laundering activity, as well as adapt to escalating regulatory requirements. “There has been an insurgence of tech suppliers offering solutions,” said Amanda Northey, regional head of APAC financial markets for Pole Star PurpleTrac, which provides vessel screening and tracking solution for banks and financial institutions, adding, “regulators in the region are reasonably in support”. She mentioned the work done by the Monetary Authority of Singapore (MAS), which is actively guiding the development of the regtech ecosystem, as an example. While complex cases may still require human intervention, many of the lower-risk checks could easily be handled by technological solutions, helping banks to reduce compliance costs and divert staff back to carrying out their core financial business. “We’ve talked about fintech and regtech; now it is time for compliance-tech,” said Euro Exim’s Bright.